→white makes lamp more gorgeous and noble,two choices-warm and white light. →This super bright LED ceiling light is far more amazing than you can image. It can light up your whole room just as an expensive light fixture do, but save more than 90% of power consumption. This light is made of high quality metal materials, safe and long lifespan. Perfect for home, living room, bedroom, bathroom, dining Room, hallway, kitchen, office, studio, restaurant, hotel, library, KTV, meeting room, show room, shop window and many other application lighting and so on. UNIQUE MODERN DESIGN -white surface & aluminum back cover & PC mirror, just as luxury light fixture when light up your whole room . COOLER RUNNING LED LIGHT BULB - die-cast Aluminum,Perfect strong convection radiating.with lower heat output so it won't cook your fixtures, which makes them safer as well. GREAT FOR INDOOR OR HOME LIGHTING - It create a tight seal with the ceiling preventing air flowing and heat loss during winter or hot air coming in during summer. When you have a lot of these, it makes a difference. 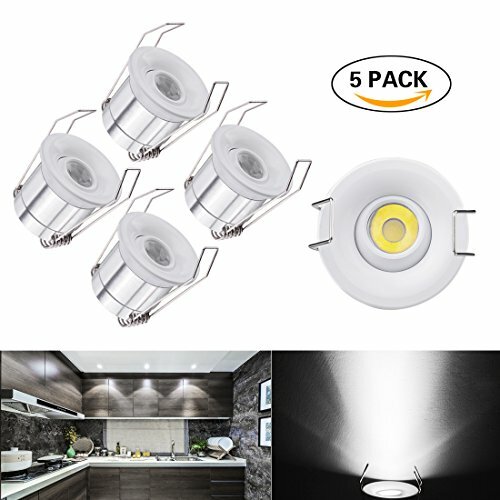 WHAT YOU GET: 5 X 1W COB Recessed Downlight Kit, 2 year warranty and friendly customer service. If you have any questions about this product by INHDBOX, contact us by completing and submitting the form below. If you are looking for a specif part number, please include it with your message.